Three Strikes for the RTRP Regulations? In baseball it is three strikes and you are out, but what about lawsuits? Three individuals sued the IRS to stop them from implementing their new regulatory scheme for registered tax return preparers (RTRP). Following is the course of events. January 18, 2013 – As the result of the lawsuit, Federal District Judge James E. Boasberg issued an injunction preventing the IRS from enforcing its new Registered Tax Return Preparer regulations. (Strike 1) The IRS then filed a motion to stay the injunction. February 1, 2013 – Judge Boasberg denied the IRS’s motion to stay. (Strike 2) The court also went on to clarify the requirements of the injunction and to emphasize that the PTIN (preparer tax identification number) program was specifically authorized by Congress and therefore not covered by the judge’s ruling. March 27, 2013 – The District of Columbia Circuit Court of Appeals denied the IRS’s request to suspend the January 18th injunction. (Strike 3) A three judge panel upheld Judge Boasberg’s refusal to lift the injunction against the IRS. The court found that the IRS had not satisfied the strict requirements for a stay pending appeal. The next major step will be a merits briefing which will conclude with oral arguments before a three-judge panel of the District of Columbia Circuit Court of Appeals. Judge Boasberg did clarify that tax preparers could take competency tests and continuing education courses but only on a voluntary basis while his injunction remained in place. 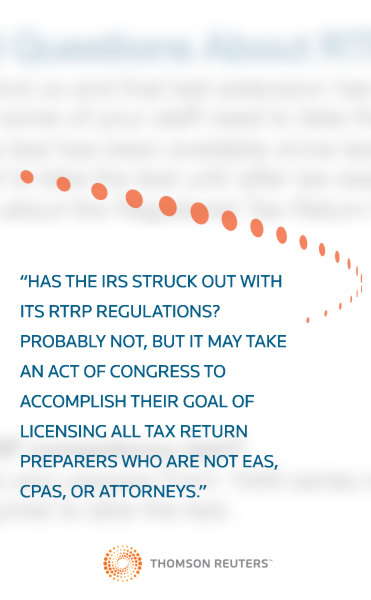 Has the IRS struck out with its RTRP regulations? Probably not, but it may take an act of Congress to accomplish their goal of licensing all tax return preparers who are not EAs, CPAs, or Attorneys.